The demonstrations in Turkey reflect a certain sense of being fed up with the authoritarian tendencies of the government, particularly the prime minister’s. Erdogan has won elections since 2002, each time with a higher percentage of the vote. He has also managed to weaken the political influence of the military with legislative changes and the series of court cases, such as Ergenekon and Balyoz. He also assumed control of other branches of the state, such as the judiciary and universities. Today there are very few university rectors or media patrons, if any at all, who can openly criticize the government or speak out for fundamental values that are threatened by governmental policies. 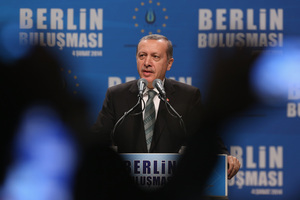 Erdogan is a strong leader who has a confrontational style. By manipulating sensitivities and cleavages in Turkish society he contributes to further polarization and has been able to increase the devotion of his supporters. Yet the demonstrations reveal the high level of uneasiness and annoyance in urban society regarding the interventionist policies of the government. Its reach now extends into the private choices of citizens. The government has attempted to restrict the sale of alcohol and has attacked the values and symbols of the Turkish republican tradition. Hopefully, the prime minister should have received a message from these demonstrations. The ranks of the demonstrators aren’t filled by marginal groups, as Erdogan claims, but by middle-class urban people, especially young people. But Erdogan seems unwilling to listen: He uses the unrest as a chance to stigmatize the demonstrators and again to manipulate class and cultural cleavages in the society. He did not use the initial chance to cool down the demonstrations and restrict police violence. 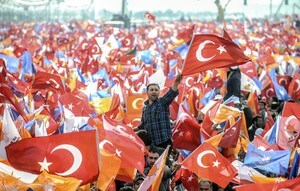 The demonstrations have also negated Turkey’s reputation as a democratic model for the Middle East. When one examines the underlying motivations of the protestors, a message in favor of participatory and consensual democracy can be heard. Electoral democracy alone is insufficient. Indeed, democracy should be built afresh every day. The environment, personal lifestyles and values have become determinants for political action. The protests are a sign that Turkey will move in the direction of a Western European democracy in the coming years. The very high pace of change in urban centers, and especially in Istanbul, has shocked many of the local residents. Each day we see a new construction starting, a new skyscraper being built. Each day a new contract is being signed for a nuclear plant, for the third bridge over the Bosporus, or for a new hydroelectric plant in the eastern Black Sea region. Each day we observe the further loss of green spaces. This makes people worried about what kind of country we are leaving to following generations. We see these developments as signs of capitalistic greed for more and more consumption and more and more profits. The government is seen as a vehicle of this trend. Remarks by the prime minister and government officials have contributed to the sense of frustration. Erdogan talked about the need for women to give birth to three children, about raising a religiously devout youth, about drunkards making laws in parliament. His tone was patronizing and derogatory towards segments of the population who did not share his views. His rule was perceived as arbitrary, and his policies were criticized as attempts at social engineering. Erdogan had forgotten that this is the 21st century, and that Turkish society has really come a long way. His populist criticisms and incriminations about republican values and the Ataturk era also offended people’s basic values and contributed further to the growth of a sense of oppression. The last important factor that fuelled people’s resentment was Erdogan’s decision to use religion as his point of reference. He even proposed legislation based on religious values! Although few people were willing to voice their concerns openly, many feared that the governing AKP party had a hidden religious agenda. In sum, this list of grievances can explain how ordinary people, many of whom probably never participated in a public rally before, took to the streets and did not return to their homes despite police violence. The AKP was a party that emerged from the periphery of Turkish politics and assumed central position with its election victories. Its ideology is based on a mix of social conservatism and economic liberalism, and it served as the political arm of a growing conservative entrepreneurial class. It legitimated religion as a source of political activism and, together with moderate liberals, also targeted the power and values of Kemalist elites. The primary opponent for the AKP was the military. After Erdogan had weakened the influence of the army generals, the AKP cadres felt that they did not have to fear opposition. Their political contenders – the two parties CHP and MHP – were relatively weak and did not gain high electoral support. However, these demonstrations have now shown that a new opposition movement is being built in an unorganized and spontaneous way. This new movement has assumed new methods of resistance and protest, such as staying in a park for days on end and passively resisting the police. 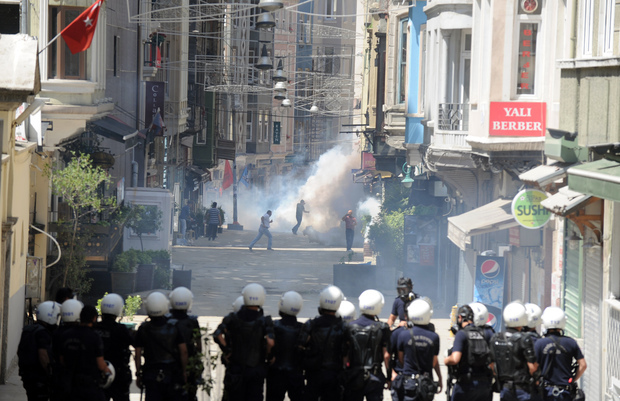 This is very important, given the Turkish context: The protesters don’t rely on the military to protect them. They can stand up on their own and demand their right to be heard and to be taken seriously by the government. In the short run, we should not expect too much change from the government. But in the long run, this protest movement may bring an end to AKP rule in Turkey. Of course it remains to be seen whether the seeds of a fresh and urban protest movement can become institutionalized and reincorporated as a political party. But the protests are an indicator of a growing middle class, which has internalized universal democratic values and freedoms and does not fear tear gas as it struggles to protect its lifestyle. “Enough is enough,” people say. The demonstrations are a sign that society is growing frustrated of AKP-style politics and can form the basis of a strong opposition and real alternative to the AKP and to moderate Islam. Cigdem Nas is the secretary general of the Economic Development Foundation (IKV) which is a non-governmental research institution specialized in the field of European affairs and based in Istanbul. She is also an associate professor of international relations and lecturer at the Yildiz Technical University. Her fields of research are EU politics, Turkey-EU relations, democratization, identity and foreign policy.